Hi guys! It’s Katie from Abella’s Braids! We are so excited to tell you that we will be contributing video tutorials from here on out! So now you won’t just see photos of our braids, you’ll get to see us in action! Be sure to check out our video tutorials twice a month on Cute Girl’s Hairstyles YouTube channel! 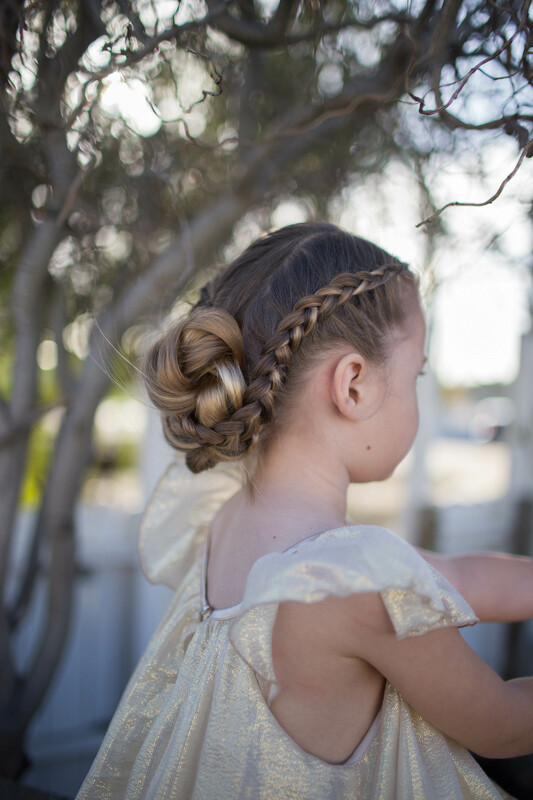 This month, we came up with a beautiful and super simple updo to show you that incorporates dutch braids and a rolled up bun. It’s an elegant style that holds up well and is great for braiders of all skill levels. I think this braid would be amazing dressed up with some flowers or a sparkly hairpiece for a wedding or special event! To create this hairstyle, start out by making a part from the front, on the side and take it down to the nape of the neck, behind the ear. Dutch braid the section with less hair and braid all the way down to the ends. Use a small elastic to secure it. For the next section, do another dutch braid but this time, finish off with a ponytail at the nape of the neck instead of braiding to the ends. Separate the ponytail into three or four sections. Roll up each section and pin down to make a bun. If you prefer, you can finish off with a classic bun or a sock bun! 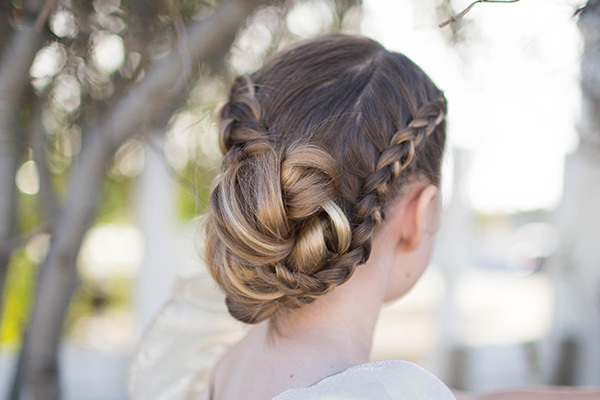 Now take the first braid you did, bring it up and over the bun and pin it down. With the remaining section of braid, we brought it under the bun and tucked the ends to hide them and pinned it down. Finish with some hair spray and you’re done! There are many ways to easily mix this braid up such as doing french or fishtail braids instead of dutch braids, and changing the style of bun you finish off with. We hope you enjoyed this tutorial and that you’ll come back next month to see our next style! 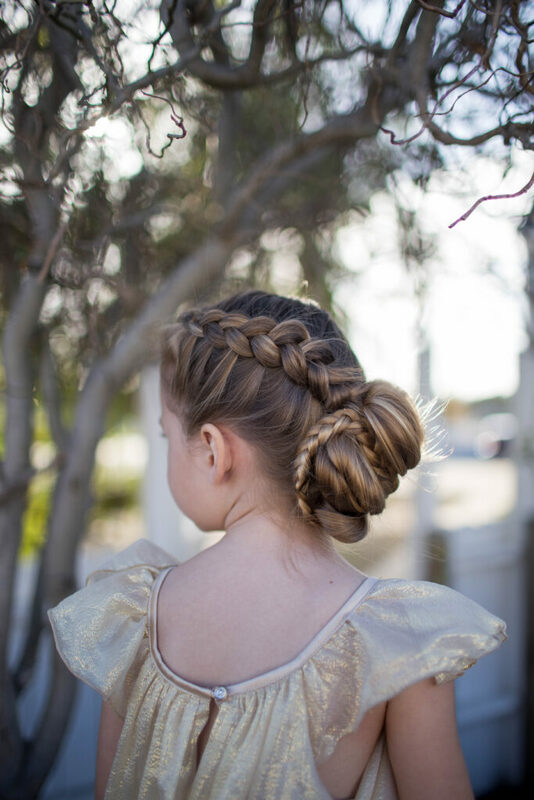 In the meantime, check us out on Instagram for lots of braid inspiration and super cute kids fashion pics (@abellasbraids) and watch for our videos twice a month on YouTube!